12" 13" 14" 15" 16" 17" 18" 19" 20" 21" 22" 23" 24" 25" 26" 27" 28" 29" 30" 31" 32" 33" 34" 35" 36" 37" 38" 39" 40" 41" 42" 43" 44" 45" 46" 47" 48" 49" 50" 51" 52" 53" 54" 55" 56" 57" 58" 59" 60" 61" 62" 63" 64" 65" 66" 67" 68" 69" 70" 71" 72" 73" 74" 75" 76" 77" 78" 79" 80" 81" 82" 83" 84" 85" 86" 87" 88" 89" 90" 91" 92" 93" 94" 95" 96" 97" 98" 99" 100" 101" 102" 103" 104" 105" 106" 107" 108" 0/0"1/8"1/4"3/8"1/2"5/8"3/4"7/8"
Faux Wood Blinds are the practical economical alternative to Wood Blinds. 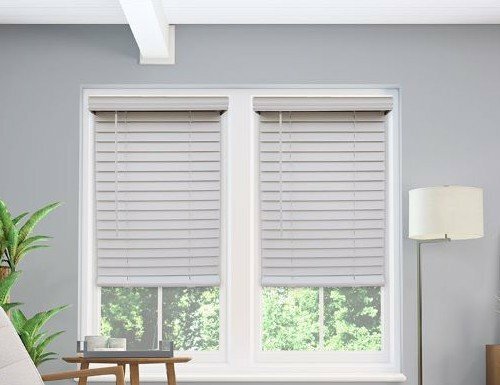 Made from PVC and a composite of man-made materials combined with wood particles, faux wood blinds look just like real wood blinds and have the additional benefit of being fully washable and unaffected by humidity. Faux wood is also less susceptible to fading and chipping. 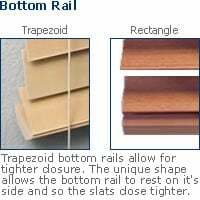 Combining these composite materials with a steel reinforced headrail makes faux wood blinds durable and long lasting. Faux wood blinds are available in a wide range of colors and textures and are the perfect addition to any home or office. 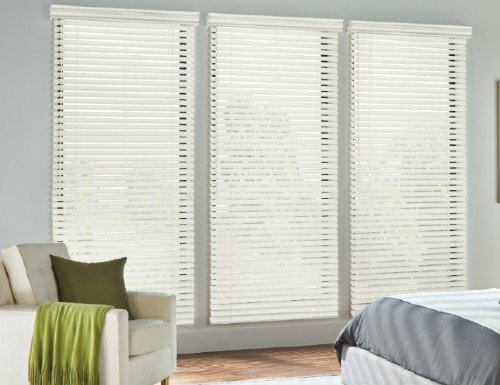 Blinds Chalet offers only the highest quality window treatment products and backs them with a limited lifetime warranty. Faux wood blinds are a great way to update your home. 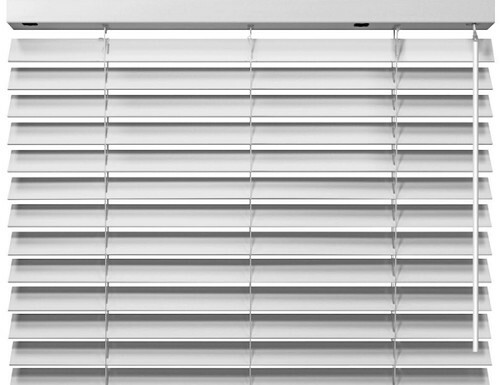 Most standard blinds feature 1 or 2-inch vinyl blind slats in order to provide optimal viewing even when they're closed. 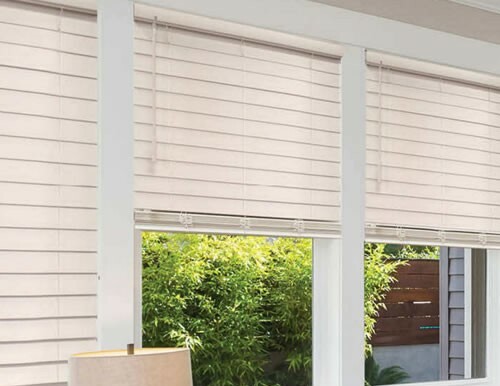 Thanks to this easy-to-use Window Covering, you'll be able to block out the sun during the daytime or maintain your privacy at night with one simple twist. You'll also be able to easily tilt the slats in order to avoid the often-discomforting glares of the sun. Faux wood blinds are also water resistant. 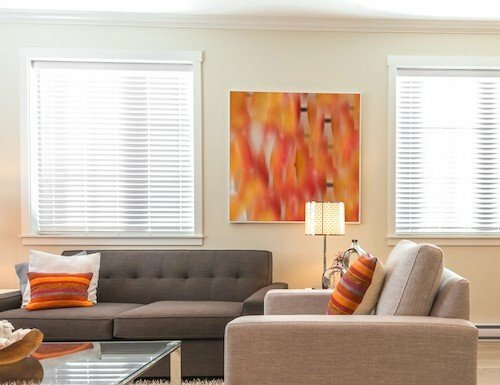 Built using high grade vinyl composite material, these window treatments will not warp or dry out when water is on them or present in the room. 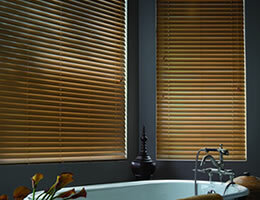 The water resistant benefit makes these blinds perfect for bathrooms and kitchens as well as other high humidity areas. 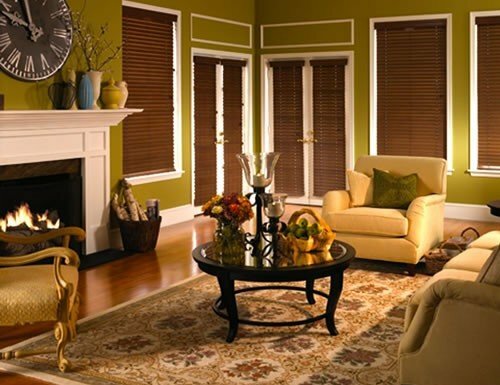 Faux blinds are also incredibly easy to maintain and clean since you can use a blinds cleaner or a wet cloth. 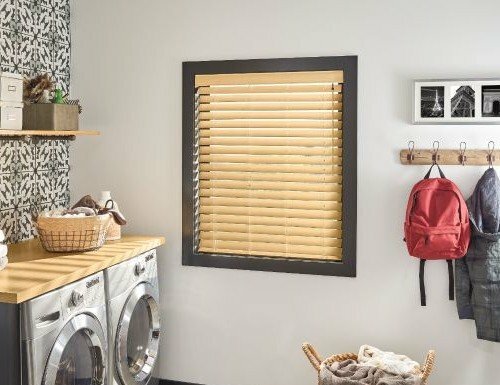 Blinds Chalet's faux wood blinds are available in multiple color options and different styles of wood, offering endless possibilities and choices for homeowners. Accessories like decorative fabric tapes and even cornice style valances can be added to spruce up the look of your window and overall look of your room. Other additional upgrades are available including routeless. 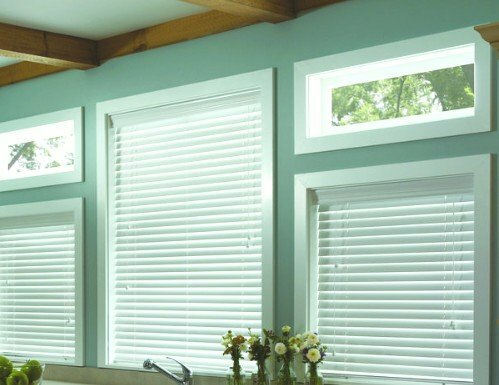 All of the blinds at Blinds Chalet are custom made for your window so you can be confident that you will have the perfect fit. Installing faux wood blinds is simple. 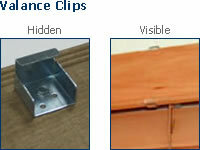 Simply install the brackets provided with the product and snap the headrail into the brackets. All of the hardware needed for installation is included with the product you ordered. Installation instructions are also provided and easy to follow. Faux wood blinds also go by many different names. The most popular are vinyl blinds, fake wood blinds, and plastic wood blinds. All of these names are referring to a window covering that is made of a strong and durable vinyl material. This vinyl material is weather resistant and also comes with a UV protective coating. The UV coating eliminates the potential of the vinyl blind to fade. 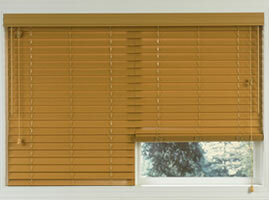 Blinds Chalet now also carries a smart privacy faux wood blind. This privacy blind doesn't contain center-cut holes. 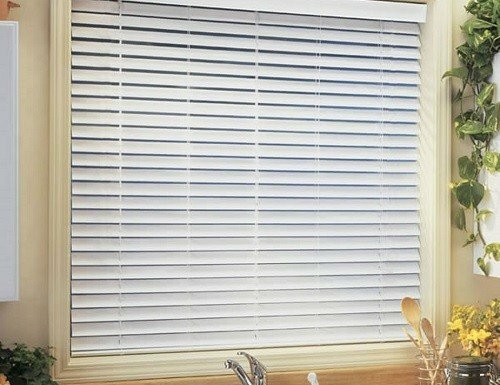 This increases your privacy and reduces the amount of ambient light that is able to push it's way through your faux wood blinds. 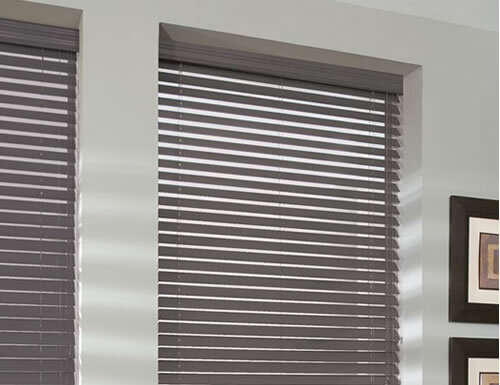 These smart privacy blinds are great for single story homes, bathrooms, and any room that you want extra privacy in. 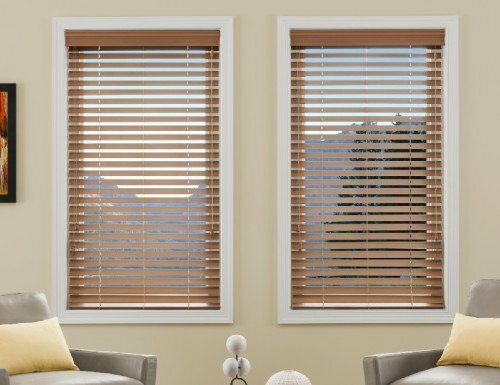 With the wide variety of color options, upgrades, durable design, and less expensive price, you can see why faux wood blinds have become so popular over the years. 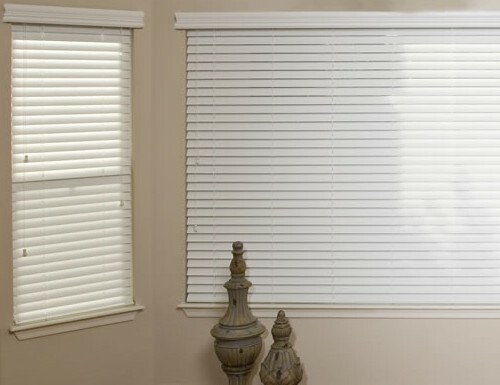 All of the faux wood blinds that we sell conform to the Child safety guidelines. This page was recently edited by Lexi Westingate. 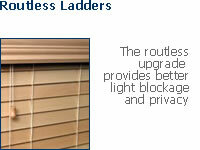 Routless ladders or no holes privacy add additional light blockage and privacy. Instead of the lift cords running through a routed hole in the center of each blind slat, the cords run though a small slit in the back of each slat. No routed holes in each slat blocks more light. 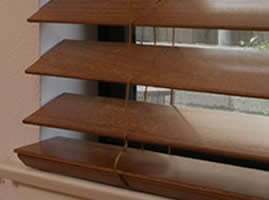 Because there are no routed holes and cords running through the center of each blind slat, the slats may shift and can also be removed from the blind. 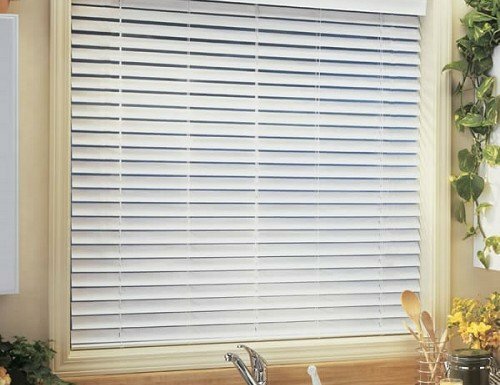 This allows for easy cleaning of the blind and therefore is not recommended for outside mount blinds or for areas reachable by pets or small children. 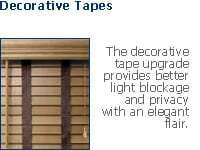 Fabric tapes offer color and style as well as added privacy and light blockage. 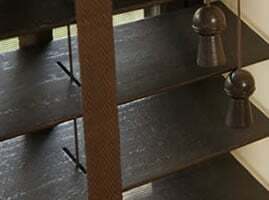 Fabric ladders replace the standard cord lift ladders and cover the routed holes in each faux wood blind slat. 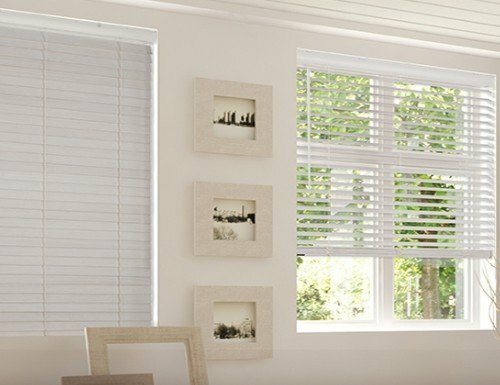 Due to the weight of the faux wood blinds, larger blinds must be separated into multiple blinds sharing a common hedarail. Each blind will come with its own set of lift and tilt controls and operate independantly from the other blind(s). To prevent the blinds from rubbing against each other there will be slight gaps between each blind that shares the common headrail. For best results align the gaps with the divider rails of the window. 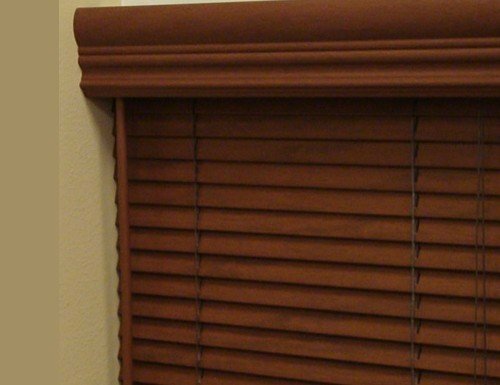 Our faux wood blinds all come standard with crown valances for free. 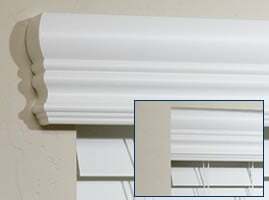 We also offer on some of our faux wood blinds an optional "cornice style" valance. This is simply a crown valance on inside mount blinds that sits outside the window frame and extends about 1 inch past on each side. 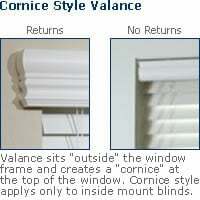 The valance also has sides or returns to create a cornice look to the crown molding valance. 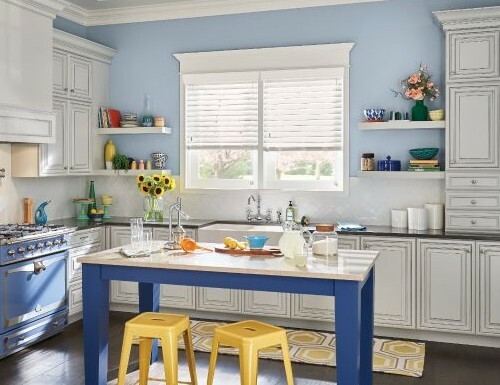 Because the cornice style valance sits outside the window frame you need to consider any obstructions such as casing around the window or cabinets, etc. that might be in the way of the valance.